To mark 11th National Day Against Human Trafficking, various activities and programs were organized through out the country. According to Ramechhap district representative Nawa Raj Pathik, the 11th National day against human trafficking has been observed with various awareness raising programs. A rally organized by Women and Children welfare office of Ramechhap has rounded the Manthali Bazar with slogans and placards. The rally was participated by various organizations active in the district and their representatives. The rally converted into an assembly after reaching the office of District Coordination Committee. Chief District Officer Dilip Prasad Lamichhane said that there is a strict law against the human traffickers however due to the weak implementation of it, the issue is becoming serious. Inspector Shyam Bahadur Thapa of DPO of Ramechhap informed about the police activity on controlling human trafficking. Chief Prem Bahadur Khadka of District Coordination Committee said that human trafficking is major issue and it needs everyone’s support. According to Morang District Representative Indira Bhattarai, 11th national day against human trafficking was observed in Morang with various programs. A morning rally was organized in Biratnagar before it converted into a triangular assembly in Rani Area. Awareness program was organized in Rani Area along with pamphlets distribution. Chief Naresh Pokhrel of District Coordination Committee Morang said that the way and structure of human trafficking has been changed recently and effective step is necessary to control this serious issue. Chief District Officer Ram Prasad Acharya of Morang said that it is necessary to make an effective mechanism to control human trafficking. He added that border, check posts and airports must be put in alert and campaign is necessary for it. Chief Durga Baral of women and children office said that in border and flood affected area, an awareness program is operating to mark the day against human trafficking. Similarly, according to Ilam district representative Kokila Dhakal, the women network of the district has organized a rally fron Tudikhel. After rally, awareness street drama was staged in coordination with Human Rights Forum Ilam. The rally was participated by the representatives from various rights organization of the district. In Rong Rural Municipality, an awareness program on human trafficking was organized to prevent possible trafficking and rescuing. A concept note was presented by the coordinator Hom Dhakal of Maiti Nepal during the program. Rural municipality chairperson Samsher Rai said that parents must be very alert in this serious issue. 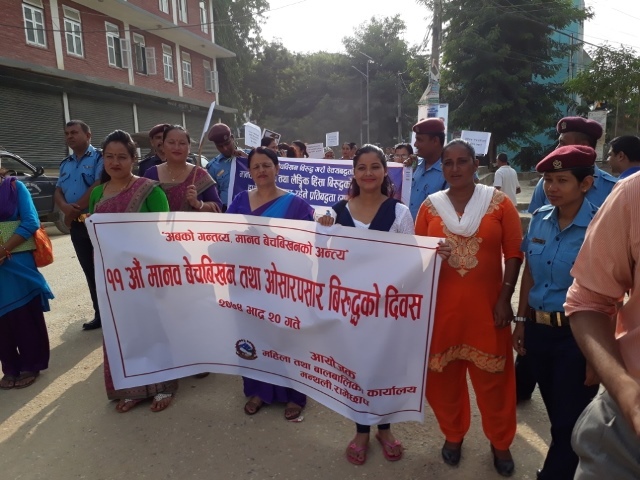 According to INSEC district representative of Kaski, Sangeeta Bhatt, awareness programs were organized in Kaski to mark 11th National Day Against the Human Trafficking. Speakers during one program on the occasion of National day have shown their concern as Kaski district is being a place for prostitution along with its growing charm in tourism. While speaking at the program after a morning rally, Laxmi G.C chief of Women and Children Office said that sons and daughters are not safe in Kaski. The program was organized by INSEC and active organizations of the district to mark 11th national day against human trafficking. Ward chairman Jagat Bahadur Pahari of Pokhara-Lekhnath Metrololis-6 said that the major victims of human trafficking is women and it is necessary that women must be more aware on this issue. DSP Khadga Bahadur Khatri of DPO said that the incident of human trafficking can be minimized if people becomes aware of it. He added that Nepal Police will always play a vital role to minimize this serous issue.